Working and traveling is harder then it seems. Trying to keep track of income, expenses and time has proven to be quite a challenge. So I’d like to mention two tools that I have found in the past year that have significantly helped me get my life under some type of control. The first one is “You Need A Budget” or YNAB for short. I found this program in May of last year and gave it a try for the trial period. Within the first month it had helped me get out of my overdraft, and helped me save enough for the program. I honestly recommend it to anyone who needs to control their money better. This includes people with low incomes, people with bad savings habits, people with variable incomes, people who live in debt, etc. Almost anybody can benefit from it, so go check it out… Give it a trial run, let me know what you think. The second one is somewhat new to me, and I’m not as convinced about it. I’ll give it a try and report back if it helps me change my habits. The program is OmniFocus 2 and it is used in time and task management. It only works on Mac, which may be a downside for some. But it lets me list off everything that I’ve been intending to do, but need to put off for one reason or another, and make sure it pops up again later in my ToDo lists. As I said, if this helps me get more done, I’ll report back and let you know how it goes. I have now been at Rainsong for over a month and I am totally disillusioned. Before arriving I had done some quick research on cheap places to volunteer in Costa Rica. Rainsong sounded right up my alley, small town in the jungle, work with animals, not to mention the price! I have been disturbed and disheartened by what I have found here. I do not recommend this “sanctuary” whatsoever. The cages for the animals are far from sanitary, let alone large enough to hold the animals captive in them. It is a sentence worse than death for the poor animals here. The owner, Mary appears to want to run a petting zoo rather than a sanctuary. She has no plans on setting any of the animals free. She has no knowledge of what animal care really is and is uninformed about the dietary needs of the animals. In the time I have been here, two animals have died, and it is not an uncommon occurrence. Mary will sit in her room all day and watch TV and smoke weed while her volunteers, whom the locals call ” slaves”, are working their hardest to keep this place running. Currently, Mary has three grown porcupines that are in perfect health and would be fine to be set out into the wild. She has an iguana, for only God knows what reason, it too could be set free. She has three howler monkeys that are consistently getting sick, I believe due to the incorrect diet and lack of cage sanitization. The local vet has told Mary on numerous occasions that things need to change around Rainsong or she will be shut down. Up until recently, Mary would refuse to allow us to sterilize the monkey’s bottles after each use and to replace their milks with fresh milk for the next feeding. At any point in time when you try to suggest anything to Mary she would lose it and start screaming at you. Recently we had a baby howler monkey, sweet Evie, die in the middle of the night because Mary got high and forgot to check on her like she said she would. Evie died because of dehydration caused by Mary overheating the incubator. 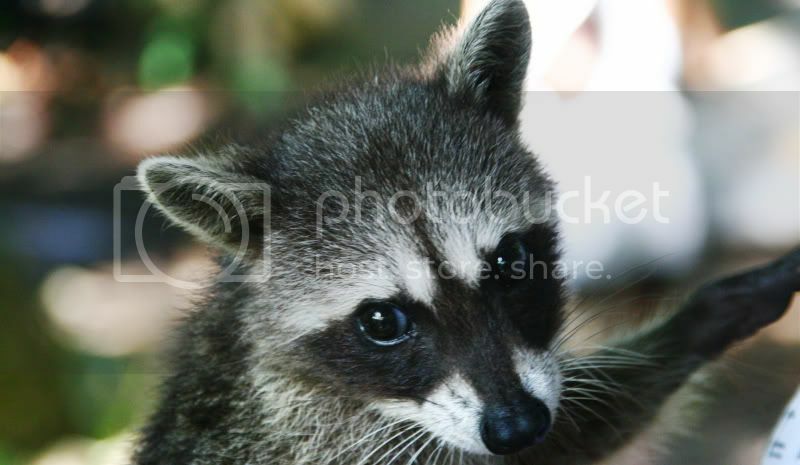 In my last blog I told the story of the baby raccoon that died from the improper medication Mary gave it. The vet in the area was appalled when she got all this information. After the vet came in to de-worm the animals she demanded that Mary adjust her routines. The cages need to be cleaned with Clorox at LEAST once a week and new animals must be quarantined with one specific volunteer tending to the one animal in case of cross contamination. Mary is already trying to get out of these new rules. Shocked? I’m not. We received a new baby howler monkey and Mary insisted that he get his recommended amount of liquids for the day. When the monkey refused to drink more Mary grabbed him from my arms and demanded we force feed him. The monkey was distressed (how could he not be) and bit Mary and she then threw him to the ground. This is not the only case where Mary demanded we force feed the monkeys at Rainsong. She will not try new tactics, or listen to other alternatives. The monkeys are already traumatized being abandoned by their family and then they are put into a hostile environment where they’re being forced to do something they’re resistant to. Accomodation at Rainsong will be far from what you hope. The shack that Mary calls the farm is poorly built and terrifying to those less rustic. Most new volunteers take one look at the shack and say “f**k this”. I was brave and tried it out. It is not as bad as it looks but it is far from what Mary makes it out to be. If you do not bring a mosquito net expect to wake up covered in bites and possibly a swarm of army ants. 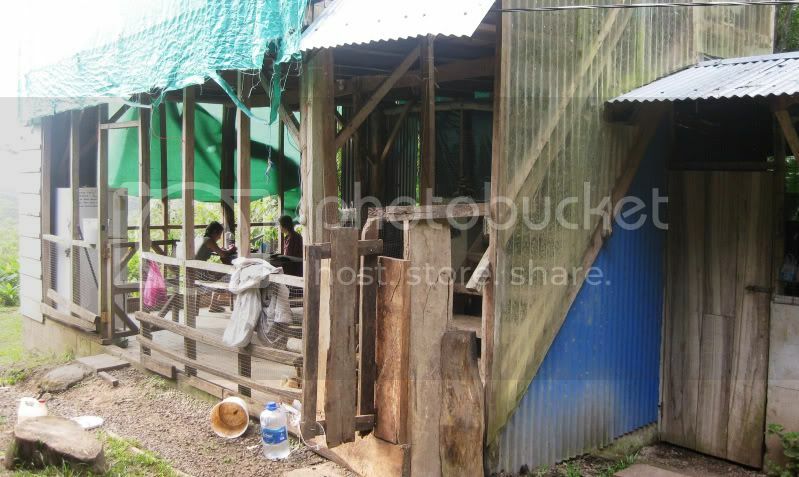 She is always expecting couples to stay up at “Honeymoon hut” which is a smaller shack further into the jungle with no walls, no mattresses (unless you want to fight the rat family living in one), no gate to keep the goats out, no electricity and no running water. They would have to hike the 10mins down to the farm to use the kitchen and to go to the washroom. There are many varying opinions about Mary and Rainsong out there and this is mine. I think that at some point Rainsong was started with the best intentions but got lost along the way. Unfortunately, the volunteers who come hoping to do some good work are supporting this sad situation so it will continue. I can see why Mary insists you pay your “donation” upfront as many will and do leave when they see what’s going on. I can only hope that eventually the vets or authorities will close this place down. Until then I urge you to volunteer elsewhere in Costa Rica. While I was making dinner one night I saw a pair of eyes glowing in the darkness of the night. Slightly worried I called one of the other volunteers down to the kitchen to investigate with me. It was a strange creature that had lurked in the dark a few nights before, a tepizcuintle, who had returned this evening. One of the other volunteers had named this creature Inspector Squinty (long story). A tepizcuintle is the largest rodent in central America. Later that night one of the volunteers was going to bed long after I had and saw something strange happen. I got up out of my hammock and just stood there. She asked me what I was doing and I then realized I was sleep walking. So I crawled back into my hammock and went back to sleep, I think I may have freaked the other volunteer out a bit! The next night we all decided to stay in and watch a movie on my laptop. The laptop died at the perfect moment, because once we turned the light on there were ants swarming around our feet. I was the first to notice and I yelped out. Everyone jumped up on to the picnic table and just stared in awe of how many millions of little ants were all around us. 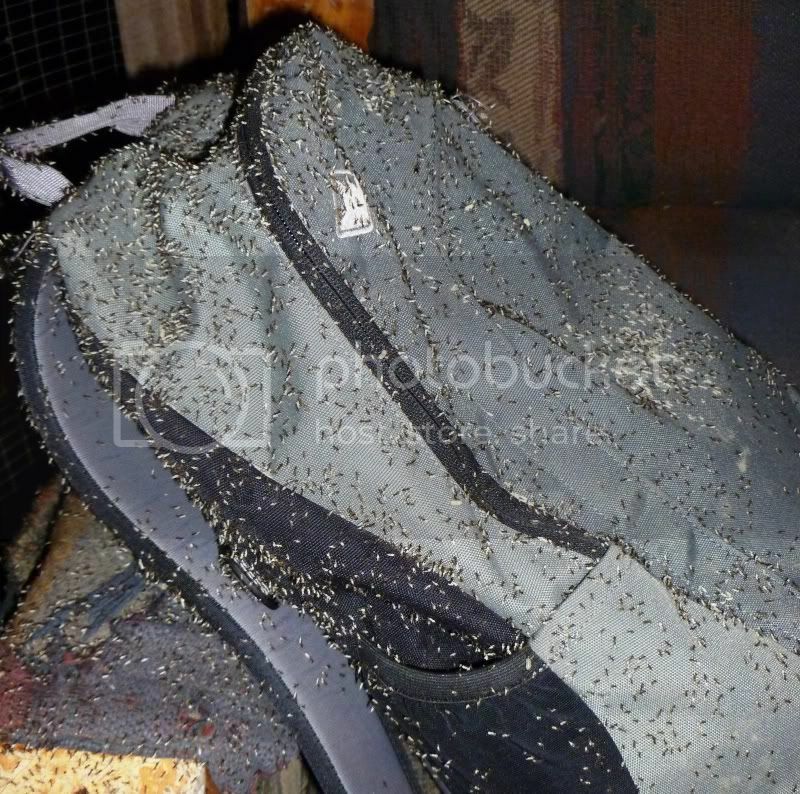 A huge swarm had engulfed Jackie’s backpack that was sitting on a decrepit couch we all avoid sitting on (maybe for this very reason). We took lots of pictures til they moved on and we decided to call it a night. I was dreaming about the ant encounter and started sleep walking again. I hopped out of my bed with a loud scream and was in distress because I could not find a flashlight. In a fit of anger I tossed everything off my bedside table searching for my light. Also I did not want to move my feet because I was certain there were ants crawling everywhere. In the middle of this fit I realized that I was sleep walking and got back into bed. The next night, it was storming and raining outside so we stayed in again. We had now figured out that the ants do not like light, therefore we kept the lights on while watching a movie. There was no “natural” excitement in the night, so Jackie found a way to amuse us all. She tied a fishing line to Kristi’s hammock and after all the lights were turned off she gave the line a tug. Kristi screamed and thought something was attacking her foot. She didn’t notice the line so we were able to do this a few more times before she figured it out. We all had a good laugh. As the creatures of the night do not like rain, they seek shelter in our room. Poor Melanie woke up at 2am to find her bed and herself covered in ants. When she woke up in disgust she awoke Sonya, sleeping next to her. Sonya herself found a large quantity of ants covering her bed as well. Oddly enough, this is the one night I slept soundly through the commotion. That morning we all woke up to the sound of Sonya’s shriek. She had been stung by a scorpion that had made a home her pant leg. She was brave and didn’t cry, but you could tell she was in a lot of pain. We all rushed to her aid and got her a cold compress and elevated her leg. The pain subsided after an hour or so but it was still quite tender for the rest of the day. 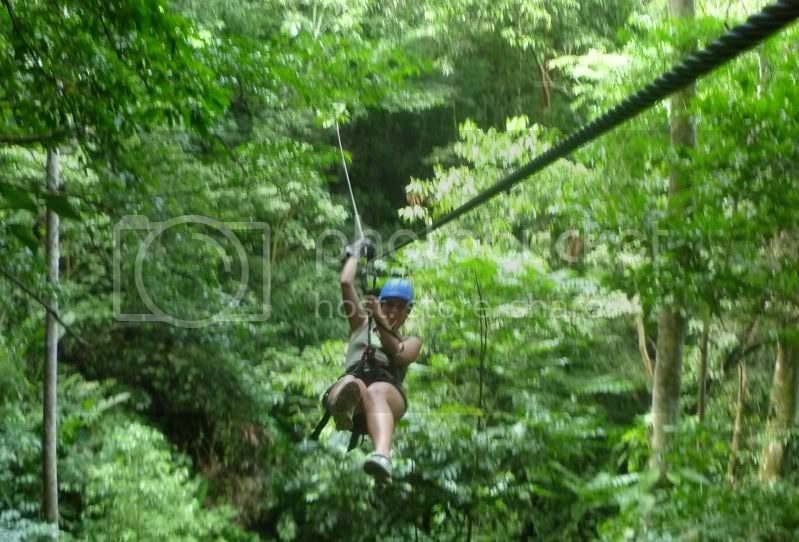 Rainsong is a wildlife sanctuary on the North Pacific coast of Costa Rica in a small town in Cabuya. They take in injured and abandoned wildlife with the hope of releasing them back into the wild. Volunteers spend many hours each day caring for the wildlife in the rescue center and help to build more animal habitats for the hospital and breeding areas. I really wanted to work with animals so I decided to come here to help out. 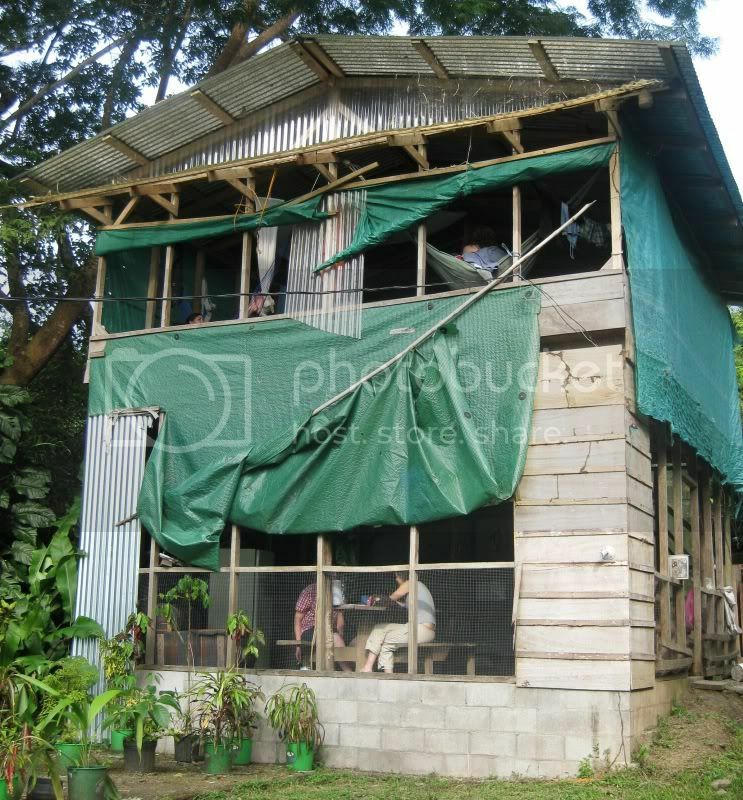 The accommodation is very basic and rustic. There is at the moment two beds with a thin mattress, various other mattresses on the floor and a hammock. The walls are simple to say the least, they go up about a quarter of the way then the rest is covered by sheets of tarp. The stairs leading up to the room are varied in sized and quite difficult to go up and down. The gate at the bottom is made for those who are quite slender and it wouldn’t surprise me if some people may have to go through sideways just to fit through. As of right now the gate is being “locked” by a piece of string to keep the goats, pizotes, and Señor Piggy out. Now for the kitchen, it has a gas stove with three burners, and you must pay extra for any gas you use. The fridge leaks water all over the floor and the interior. That being said, you want to keep your food outside in the other fridge that is not being used as a fridge but as a dry cupboard. Other than that the kitchen is very basic, there is no oven, though there is not much you need an oven for. The toilet is located a bit of a walk away from the kitchen and is awfully dark at night. I personally have seen worse toilets but the other people staying here are quite horrified by the likes of it. It’s outhouse-ish but with a flushing toilet. The door is merely a sheet draped in front. The toilet is also home to many strange and interesting spiders. Be warned. The shower is quite nice in my eyes. It’s a bit further up than the toilet and is three walls with a shower head in the middle. There is no roof and you stand on a small plank of wood under the shower head. It’s surrounded by quite a bit of trees and bushes. There has been a few mornings where I’ll be showering, then all of a sudden leaves will start falling on me and I look up and there is a group of white faced monkeys playing in the tree right above me. My journey to Costa Rica was a very interesting . The first 6 hours or so were fine, I slept for the most part. When we stopped in Nicaragua to pick up some more passengers and I had a fellow Canadian, older gentleman sit next to me. What I had in store for the next 6 hours I was not prepared for. Turns out this man was “bi-polar”! Lucky me, he had been on anti-psychotics since 1980 but then 10 days ago decided to stop taking them! FANTASTIC. He was always kind to me, but when the music was too loud and the bus attendant wouldn’t turn it down, he’d lose it. Swearing, talking about strangling their necks and so on. I edged closer to the window at this point just waiting for him to turn on me. He was constantly talking to me while I was trying to watch movies on my laptop, listen to music or sleep. Most of the time, he was trying to get me to calm him down about loud music . Then when it came time to pay the Nicaraguan border fee he only had two out of the three dollars due, I lent him $1 to help him out. Then at the Costa Rican border, they had already rejected him once before and now they were trying to do it again because he did not have proof of a return flight to Canada. So he pulls me over and is trying to get me to translate and explain to him what he has to do to get across the border. He needed to buy a $20 return ticket to Nicaragua, but he obviously didn’t have the money. So he asked me for it, well by asked I mean begged. He was very scared and didn’t have anyone else to help him. I gave him the $20 to buy the ticket. He was so thank ful and was asking how he could repay me. I just said “pay it forward”. 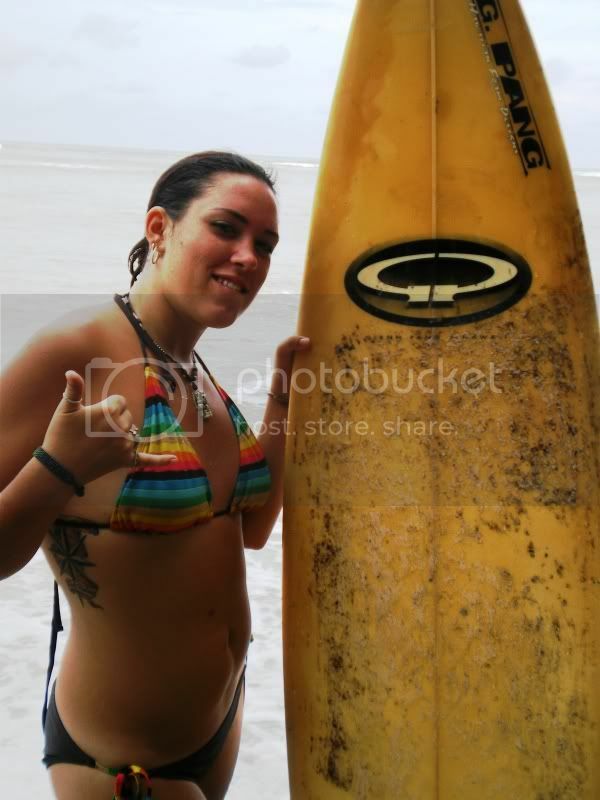 I got dropped off in Punterenas later that night. Kind of scary being on the side of the road alone at night but I grabbed a cab to the ferry to Paquera. I was worried what I was going to do once I got there as it was very late at night and the buses had stopped running to Cabuya. I chatted up a man on the ferry and he offered to give me a ride more than half way there. Score! Once he dropped me off I caught another cab up to Rainsong Sanctuary. A girl named Cher met me outside and helped bring my bags inside. They had set up a bed for me, outside, with the dog. Once again, lucky me. I woke up in the morning to a baby monkey crying next to my bed . It was the first time I got to hold a baby monkey that day. There are two baby howler monkeys, Evie and Frannie, that have been orphaned due to electrocution. The older howler monkey, Mona, is here because an alpha male from her pack beat her and her tail was lost in the process. I also get to feed and play with raccoons, porcupines, turtles, parrots and toucans. Later another volunteer, Kristi (same name and from Vancouver too…creepy) waled me up to the long-term volunteer lodging at the farm. It is….RUSTIC to say the least. There was just three of us staying at the moment. Kristi was sleeping in a hammock and the other girl, Jackie, had the one real bed in the room. They offered me a mattress on the floor or Jackie’s little blue crap hammock. I took the hammockso I wasn’t on the floor with the jungle creatures. 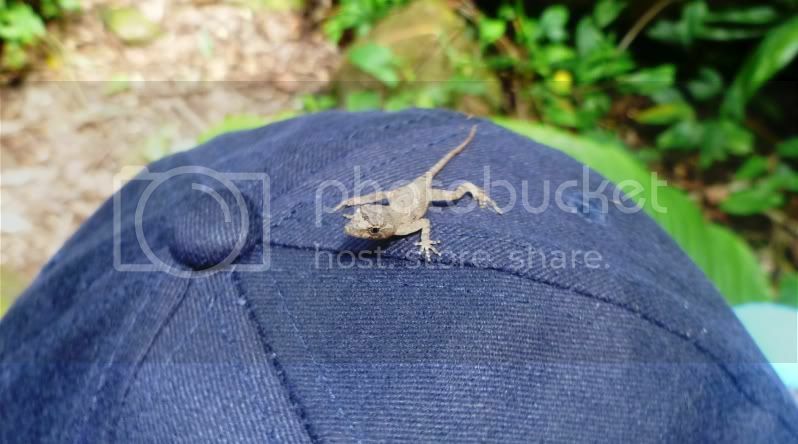 Our little lodge does not have walls and is very open, therefore little creatures can get in quite easily. Ah, home sweet(?) home. We got to the bus station to grab the bus to Copan. Little did we know what adventures this bus ride would have in store for us. While we were in the jungle it had rained heavily every night, making the roads very unstable. I was looking out the window at the gorgeous lightening storm that was in effect when one of the lightning bolts struck a tree right outside my window. It made an extremely loud cracking sound and sparks went flying, absolutely amazing. Further down the road we came to a stop, an awfully long stop. I looked at the window and saw buses and other vehicles turning around. Turns out there had been a mudslide that was now blocking the road. It was starting to look like we’d have to spend the night on the bus, and none of us had eaten. So, in the dark rainy night we ventured to a corner store and bought an exceptionally nutritious dinner. Jalapeno chips, hot dog buns, cheese, cookies and mini sausages of only God knows what kind of meat (I did not partake in eating the sausages). Finally the bus made some movement and we were on our way again, some workers had cleared the path making it so we could continue on our way. Once in Copan at one o’clock in the morning, in the pouring rain, we tried to find a place to sleep. Most hostels we tried were full, but we managed to find one. 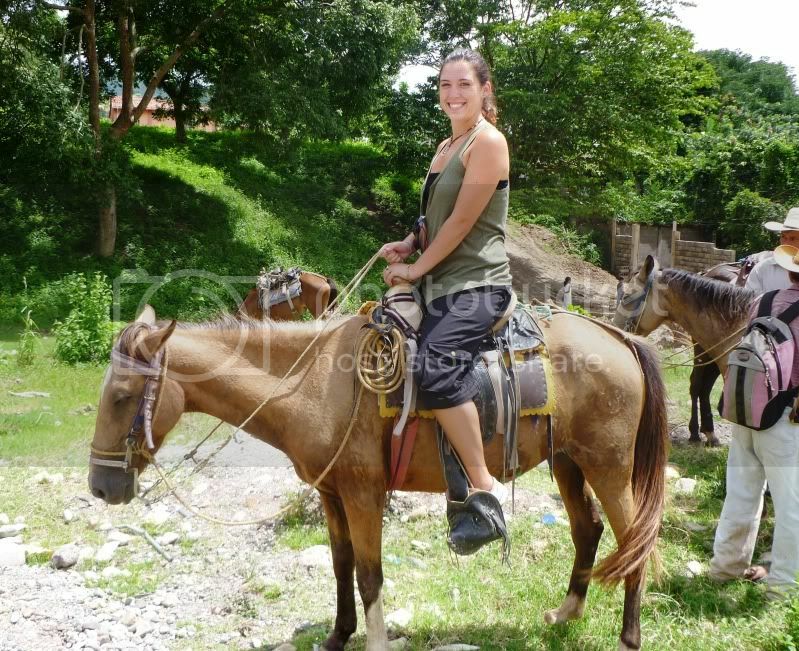 The next day we changed locations to another hostel and decided to book a horseback riding tour. The horses looked more like donkeys and the tour guide only spoke Spanish. I don’t know what came over me that day but I was in the giggliest of moods. Watching Rich’s loco horse jerking him around and him freaking out was bringing tears of laughter to my eyes. Then looking to the other side and seeing Imran leaned back and talking to his horse like they had been mates for life, I was hysterical. I chatted with the tour guide who was babbling away and I was merely smiling and nodding understanding only a few words per sentence. By the end of the tour we had all gotten very comfortable on our horses and we were racing and cutting each other off (yes, I was still laughing). Rich and I woke up early one morning to climb, the recently erupted, volcano Pacaya. We managed to get a great group and an insane guide, who suited us just fine. Once we hiked the hard part we were running and sliding down hills of loose volcanic gravel down to the volcano’s crater. We walked across hot coals to a large hole in the ground exposing glowing red hot lava. We took the marshmallows we had bought earlier and threw a couple in and watched them catch fire before even hitting the lava. Once we had all taken a few pictures we made our way back in a cloud of steam from the heat of the sharp lava rocks beneath our feet. We made a quick stop to roast some marshmallows on the rocks and our guide just used the rocks to light his cigarette. The way down was much faster than the way up, we all charged through the gravel and slid down the side of the volcano until we reached the bottom. We all stopped before getting into the bus to empty our shoes. Little piles of gravel formed from what had accumulated in our shoes. A year ago today I left Canada hoping to escape my old life and start new. To get away from the constant work of my job and try to build a business I could run from the road. In my mind I know what criteria would make it work and I have a good idea of what it would look like when it is done, but actually getting it going, well that has been another story. It is true the dollar goes further here, and that really does help, but it is also harder to work with no fixed address. And with debts back home and obligations to others my year of working abroad has been a very difficult and grueling challenge. I have been gone from living a dream to living in a constant challenge waiting or hoping money will arrive so I can pay my bills and then myself. Certainly this experience has come with its ups and downs. I have been to several countries I have never been to before, I have started learning Spanish and had fun going on long hikes, white water rafting, exercising in ancient military playgrounds and scuba diving. I have eaten more variety of Mexican food then I even thought existed. I have met wonderful people from all over the world and right next door. My girlfriend, Soraya, is showing me a side of Mexico I never would have otherwise seen, I am truly grateful for her. I have also been to the point of eating just rice and beans for weeks while working 10+ hour days. I have been cast back into the role I tried so hard to get away from. Routine is the order of the day and there often feels like no escape. But there is a light at the end of the tunnel, as there always has been, but for now it feels like my hard work, sweat and tears are going to be required to get me out of my shackles back home. I just want something, anything, that would help me build residual income. I suppose many people are looking for that, and few people actually find it. In the meantime I owe, I owe, so its off to work I go.